How will Jupiter transit into Scorpio affect your moon sign? GURGAON, India - Sept. 10, 2018 - PRLog -- Planetary transits are one of the most important and auspicious events of every year's cycle. They tend to bring subtle changes and chances of betterment in life on various aspects which people can take full advantage of. These transits help in growth and success in the personal, professional and financial aspects and are considered one of the most useful events according to Vedic astrology. Jupiter transit is one of such major transits of the year which has great importance and impact in our day to day life. After one year, Jupiter will move from Libra to Scorpio on 11th October 2018 and stay there till 4th November 2019 and is expected to change your life in matters that you cannot even think of. Jupiter is the largest planet of the solar system and has an influential effect on different zodiacs differing on its planetary movements and positions in your birth chart. This year the planet is going to transit into the sign of calm and cool nature, seeing how will it impact your life will be must to know. 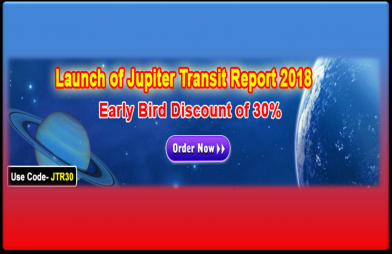 With Jupiter Transit Report 2018 at 30% discount, you can get a glimpse of all possible changes and challenges that can come and influence your daily life and routine habits. We all know how comforting it can get if we already know what future holds for you and especially when planetary transits are going to happen. There are both favorable and unfavorable circumstances that may come after Jupiter transits into Scorpio this year, so be ready for both the situations. There is no much time left when one of the biggest transit of the year is about to happen. Are you ready for it? We all know very well that Jupiter transit into Scorpio is one of the major transits of the year and leaves a remarkable impact on the different front in life. What will it change for you for all the important aspects of life? How favorable or unfavorable is it going to be for your future prospects? Explore with your Personalized Jupiter Transit Report 2018 and plan ahead to make your life more contending, pleasing and comfortable. Order your report today and get an introductory discount of 30% on your copy. One should stay ready with their roadway to success and plan their upcoming life in a perfect space with the Vedic astrology based Jupiter transit report 2018.